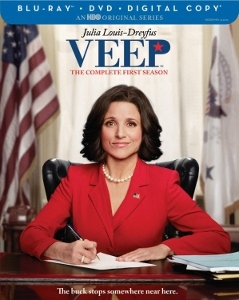 Julia Louis-Dreyfus won an Emmy for her performance as Vice President Selina Meyer on HBO’s sitcom Veep. Has the actress found a second signature character? The first, of course, was Elaine on Seinfeld. It’s hard to say, considering she was also awarded an Emmy in 2006 for The New Adventures of Old Christine. The public, by and large, continues to associate Louis-Dreyfus with Elaine. Time will tell, but I think Veep has the potential to develop into something very funny and memorable, not just for Louis-Dreyfus but for everyone involved. The eight-episode first season is available on Blu-ray and DVD March 26, and it’s an extremely breezy, light, and often funny viewing experience. Like so many other modern sitcoms, there’s no studio audience or laugh track. The cameras observe the characters’ behavior almost like a documentary film, but unlike, say The Office, they aren’t aware of the cameras. Selina and her staff just play off each other in loosely structure plots that focus on their day-to-day activities. Yes, it’s obviously political in nature but in a vague enough way that I doubt any viewers will be turned off, regardless of their party affiliation. In fact, if you consider yourself more or less apolitical there’s still much to enjoy about Veep. While there’s plenty on Selina’s agenda about “clean jobs” and other policies, most of the humor comes from the veep botching various public appearances and speaking engagements. The running gag is that Selina is a completely self-centered, bumbling idiot. The people around her, including Chief of Staff Amy (Anna Chlumsky), Director of Communications Mike (Matt Walsh, and Mike’s deputy Dan (Reid Scott) are possibly sharper than he, but they’re even more bent on advancing their careers. Arrested Development fans may have a mixed reaction to the presence of Tony Hale as Gary, Selina’s perpetually nervous, overly eager-to-please aide. 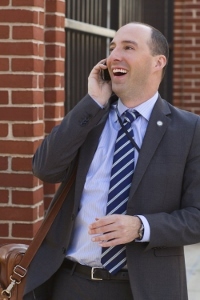 While he is undoubtedly funny in Veep, he always seems to be evoking Buster from Arrested. 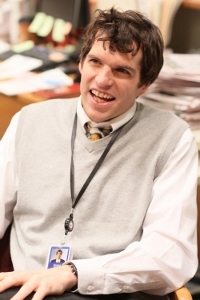 Timothy Simons is a standout as Jonah, the President’s liaison to the White House. Jonah is among the better distinguished and quirkiest characters in the series, always boasting about his personal contact with the President (which is, in reality, quite limited). Speaking of the President, we never see him throughout the first season. It might be interesting to see Selina interacting with her boss at some point in future episodes. In fact, there are quite a few things set up in this first season for further exploration. I hope that happens, because the biggest weakness of Veep is that it coasts by on the cast’s ability to toss off sarcastic insults and not much else. There’s an overall thinness to the material that keeps it from ever really making a notable impact. That cast works well together, but hopefully they’re given more to sink their teeth into. It’s also a bit hard to like or sympathize with any of them, although Gary comes across somewhat endearing as he struggles to attend a photo op with the Baltimore Orioles just to impress his scornful father. The episodes look great on Blu-ray. It’s not a very visually interesting or inventive show, but there’s plenty of detail in this sharp picture. The DTS-HD Master Audio 5.1 is also good without being very interesting. Veep is a heavily dialogue-driven sitcom, so the centered, clear speech is the focal point. A little ambiance is evident in the rear channels when appropriate. Supplemental features include a dozen commentary tracks with cast and crew, 25 minutes of deleted scenes, and a 13-minute making-of featurette. The Blu-ray set also includes the episodes on standard DVD. For more on Veep, visit the official website.